Chopard SS XL Chronograph Sport Reference 158961-3002 Automatic! Chopard Chronograph (HUGE) XL 158691-3002, TWO O TEN, Automatic, 37 jewels, Chronograph & COSC, serial 10691xx. 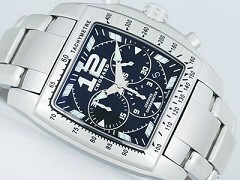 Stainless Steel Case and Bracelet, Has White Mother of Pearl Dial instead of Black, Chronometer, hours, minutes, small seconds at 3, date between 4 and 5, chronograph function, 12-hour counter at 6, 30-minute counter at 9, solid case back, Scratch Resistant Sapphire Crystal, hidden folding Clasp, Water Resistant to 50m, 59 mm from lug to lug x 46 mm plus x 12 mm. Chopard SS bracelet with SS double Deployment clasp. Boxes, papers, open guarantee, tag too! Retail is $12,380...Sell for $7000 or TRADE!